hula dancing by Allen Ogi and his partner Mili. Irene Jenkins (Aratame) is a long time potter and began going to Ikebana shows to see what kind of vases were used. In 1997 she decided to take an adult education class in ikebana and she studied with Michiko Hosoda, a Wafu teacher for several years. She elected to study Aratame when it was formed in the U.S. and has studied with Sumi Metz ever since. 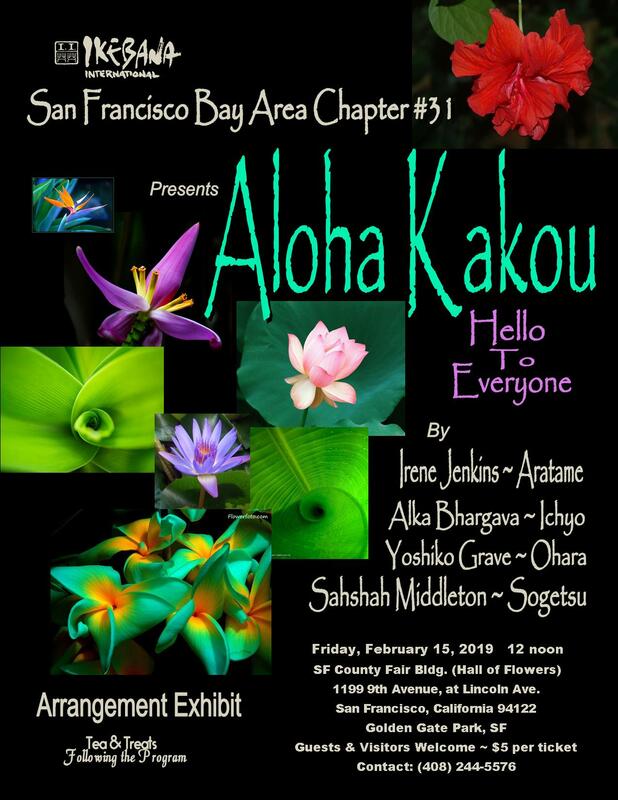 She joined Ikebana International in 2001 and has served on various committees, participated In the Flower Shows and represented the chapter at Bouquet to Arts. In 2017 she was awarded a teachers certificate by headmaster Seigyo Aratame and given the flower name Waka. She encourages all potters to take up Ikebana and all Ikebana devotees to try pottery. Sahshah Middleton (Sogetsu) was born in Singapore South East Asia and was discovered at the age of 8, by Mrs. Kasume Kim, the founder of the Sogetsu Chapter in Singapore. She has over 50 years of experience in flower arranging. She studies with Yoshiko Williams and has received the Master’s Degree “Jonin Somu”. She is a graduate of the Nang Yang Academy of fine arts. She received her Horticulture Certification from Singapore Botanical Gardens and is a certified arborist. She has affiliations with Strybing Arboretum, San Mateo Rose Society, Begonia Society, Epiphyllum Society, Sogetsu Bay Area Branch, Ikebana International San Francisco Chapter, OFAD and Floral Division Manager for San Francisco. with Mrs. Suiyo Fujimoto since 2009. She received the 3rd Term Master Course in December 2016.
and also enjoys walking and reading. contemporary designs, and fuses elements of both the East and West.